The last time we made anything containing turkey was when we lived in the US. We usually ate some version of turkey on Thanksgiving, some years we celebrated the traditional way with friends and others we went out for dinner. As Thanksgiving were two days ago I figured it was a perfect time to make a dinner based on turkey. I researched recipes on my train ride to Stockholm yesterday afternoon and found two I liked. For some reason the recipe app I use didn’t transfer the recipes to “the cloud” correctly so when we went to the grocery store today we only had one recipe to pick from… tonight’s dish: Oriental Turkey. 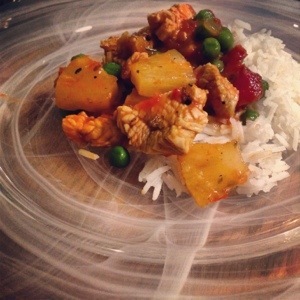 Turned out quite tasty and we’ll definitely use it again but with some changes in regards to spices. The recipe didn’t have as much flavor as we like. I also made a very easy dessert… crush a Digestive biscuit and put at the bottom of a small glass. 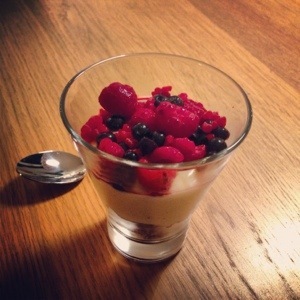 Fill with a few spoons of vanilla quark and add berries to the top. Put in the refrigerator before serving. Enjoy!